Dénomination enregistrée: MENNONITE HERITAGE VILLAGE (CANADA) INC. The mission of the Mennonite Heritage Village is to preserve and exhibit for present and future generations the experience and story of the Russian Mennonites and their contribution to Manitoba. For over fifty years, the Mennonite Heritage Village has brought the story of the Russian Mennonites in Manitoba to life! The forty-acre (17-hectare) site recreates a traditional Mennonite street village containing twenty-six heritage buildings. Visit the working Windmill – the only wind-powered, fully-operational mill of its kind in Canada! The village also features two original Mennonite housebarns from the late nineteenth century, a log house, a Mennonite private school from 1885 and the Barkfield Public School from 1919, an Old Colony Worship House, and an original one-room 1884 general store. Step back in time as you enter the Semlin (sod house) to discover what life was like for pioneers settling on Manitoba’s prairie in the 1870s and visit the recreated Livery Barn Restaurant, serving delicious, traditional Mennonite food. Explore the blacksmith shop to watch the blacksmith in action, or stop by during Pioneer Days to witness historic demonstrations including steam-powered threshing and saw-milling or bread baking in the outdoor clay oven. Highlighting the museum’s collection of over 16,000 artefacts, the outdoor village and indoor galleries tell the story of Russian Mennonites from the sixteenth century to today. 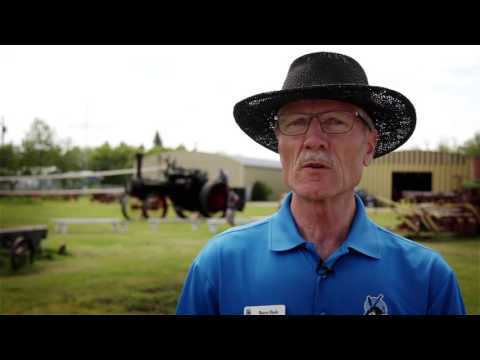 Over 45,000 visitors a year experience Manitoba’s pioneering past at Mennonite Heritage Village. Help us tell the story.